Posted on 5, September 2016 by EuropaWire PR Editors | This entry was posted in Austria, Construction, Infrastructure & Utilities, Slovakia, Sports and tagged Bratislava, National Football Stadium, NFŠ a.s., STRABAG SE, Thomas Birtel. Bookmark the permalink. BRATISLAVA, 05-Sep-2016 — /EuropaWire/ — STRABAG SE, the European technology group for construction services, has been commissioned by the investor NFŠ a.s. to build the new National Football Stadium with more than 22,000 seats in Bratislava. The structural works including the technological minimum equipment to be built by STRABAG are scheduled for completion in 2018. The contract has a value of € 50 million. The stadium is being built at the site of the old Tehelné pole Stadium that has since been demolished. 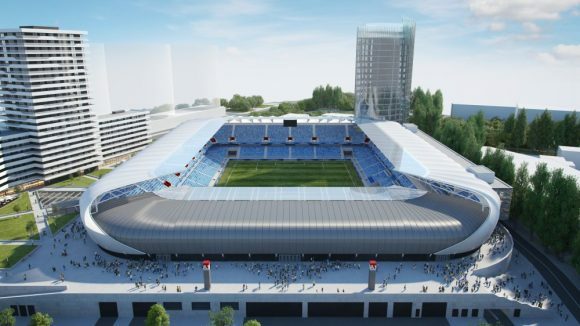 The new stadium will meet the requirements for a UEFA Category 4 stadium, which means it will have the capacity to handle international matches. “The National Football Stadium gives Slovakia’s football a modern game venue. We look forward to being able to apply our know-how here in the construction of stadium and sports facilities,” says Thomas Birtel, CEO of STRABAG SE. STRABAG SE is a European-based technology group for construction services, a leader in innovation and financial strength. Our services span all areas of the construction industry and cover the entire construction value chain. We create added value for our clients by our specialised entities integrating the most diverse services and assuming responsibility for them. We bring together people, materials and machinery at the right place and at the right time in order to realise even complex construction projects – on schedule, of the highest quality and at the best price. The hard work and dedication of our 73,000 employees allows us to generate an annual output volume of about € 14 billion. At the same time, a dense network of numerous subsidiaries in many European countries and, increasingly, on other continents is helping to expand our area of operation far beyond the borders of Austria and Germany. More information is available at www.strabag.com. The STRABAG Group has been operating in Slovakia since 1991. In 2015, the 1,800 employees in the country generated an output volume of more than € 700 million. More information regarding STRABAG Pozemné a inžinierske staviteľstvo s.r.o. is available atwww.strabag-pozemne.sk.